City & Guilds of London Art School alumni, Max Malden (BA (Hons) Conservation 2012), Hans Thompson (BA (Hons) Conservation 2013) and more recently Kirsty Walsh (BA (Hons) Conservation 2015), have experienced great success with the conservation company Max and Hans co-founded in 2013. 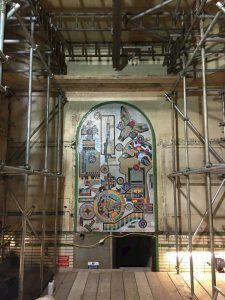 Orbis Conservation, specialising in the conservation and restoration of three dimensional art works and architecture, designed and executed a conservation package of works to re-home Eduardo Paolozzi’s Mosaic in Tottenham Court Road Tube Station, as part of a £400m redevelopment to accommodate Crossrail. As the only stand alone piece designed by Paolozzi, the mosaic has unique status. 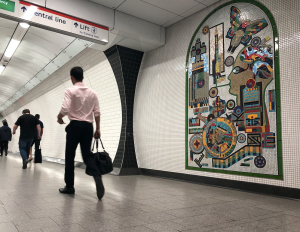 The team designed a steel lifting frame which was placed around the artwork and then moved the mosaic to platform level, seven storeys below, where it is permanently visible to admiring commuters. A short film about the conservation project can be seen here. 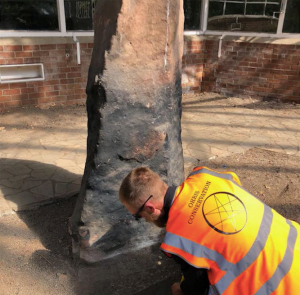 Another project of national and historical significance currently being undertaken by Orbis Conservation is the conservation and re-display of the Calderstones, six megaliths from the late Neolithic period, decorated with prehistoric carvings. The stones had been moved from their original setting as part of a burial mound, and set as a stone circle encased inside a glasshouse with poor public access. As part of this project, the stones will be redisplayed in a more accessible environment and the public encouraged to more fully engage with them. 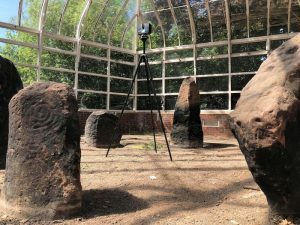 So far, Orbis have 3D scanned the Calderstones with a view to gaining a full understanding of their condition and providing an accurate record for possible future reproduction purposes. 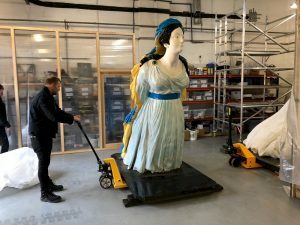 Covered in the July issue of The Art Newspaper, a further project currently occupying the Orbis team is the conservation, consolidation and restoration of five, large 19th century ships’ figureheads to be displayed at The Box, Plymouth, a new arts and heritage complex being created as part of the city’s Mayflower 400 celebrations. The projects undertaken by Max, Hans and Kirsty at Orbis Conservation are a great example of the type of work a high percentage of the Art School’s Conservation alumni find in the Heritage Sector. Our rigorous Conservation Studies syllabus, including art histories and historic decorative and making techniques, conservation ethics and approaches, analysis and reporting plus analytical and conservation scientific processes, fully equips graduates to work on these types of high-profile, historically significant projects.